There was some titles I immediately knew I wanted to include – like Ray Bradbury Fahrenheit 451 and Dumas The Count of Monte Christo. But then I just went through my wish list, added the books I felt for. I have to admit that apparently, not that many classics have spoken to me. I only ended up with a list of 55 novels – so 30 novels out of my 1000+ wish list are what I determine classics…! That’s just sad! 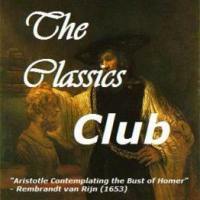 If I had known that, I probably would have joined The Classics Club a lot sooner to get more recommendations…! But anyway, here’s my list. I haven’t paid attention to making sure both men and women are included or that all the authors aren’t ‘old white men’ but I still have a bit of everything, I think. The last to be included was Ernest Hemingway – I’ve been putting of reading him for so long, him being this big game hunter who drank too much, but I’m slowly coming to the realization that I might actually still like some of his works… So I kicked Mervyn Peake off the list and added Hemingway.